As the name suggests this breed originated from the Rouen, France, which is famous for the Notre Dame cathedral. However, if you go to France to find a pair of them then you will find them called the Rouen fonce. 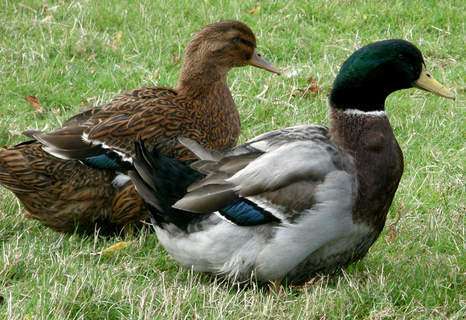 It is essentially a large version of the Mallard , created by selective breeding of domesticated Mallards. The Rouen is quite a plump, imposing but stately bird. Due to its large size the Rouen has a reputation as a high quality roasting bird but it is now regarded as being a slow grower, taking over a year to reach full size. The females are a mixture of brown / greenish black and the drakes have wonderful iridecent green heads with black purplish bodies. They are more easily tamed than the Mallard and have a slightly lazy air about them. They are also relatively quiet. Grey is the standard colour although there is now a much wider selection including Black, Blue and Pastel. We have 4 rouen ducklings that are about 3 months old. They have been very entertaining to raise. They have transitioned from a box inside our utility room to the big pond/creek behind our house. They are very social and stick together like glue. 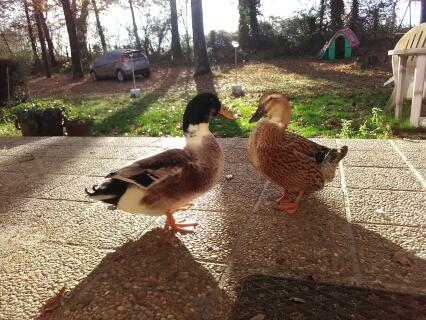 Whenever we come outside they come waddling and quacking up toward the house. We first let them learn how to swim in a blow up child's pool until they got too big and started getting out. They have made an adjustment to the pond. At first they would not get in the water, but everyday they become more adventuresome. I would definitely recommend them for pets. They have a lot of personality! We had rouens a few years ago, fell in love with them and have kept them ever since. They are large, very docile amd beautiful. Our children handle them and love them - real characters.